On this slide is a photo of the type of cuckoo/chirp signals that were installed in the U.S. The photo shows a visual pedestrian signal with a speaker mounted on top of the signal. A sign over the pedestrian signal says "Pedestrians must push button". 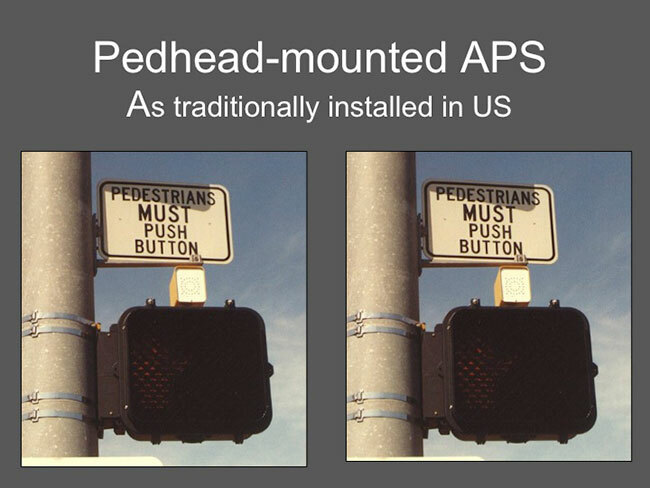 Note that pedestrians who were blind were unable to read that sign telling them that they needed to push the button. Click on the buttons below to play the cuckoo or the cheep sound.